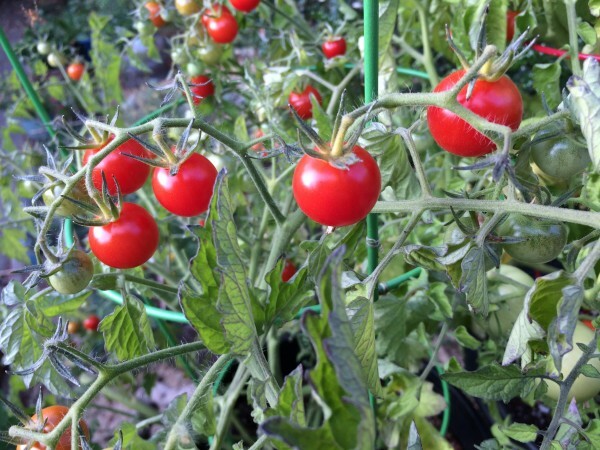 It’s mid-summer and you have your tomatoes planted in healthy, well-drained, nutrient-rich soil. You water your tomatoes with a soaker hose in the early morning before work. Your staking system is a work of architectural perfection. But with one swift wind on a cool, humid day, spores from an infected plant up to 30 miles away will send your picture perfect crop into a mess of brown spotted tomatoes and lesion-filled branches and leaves dusted with white spores. Just 3 to 5 days after the wind storm the battle with Tomato Late Blight has begun! Luckily you can create allies with other neighbors, warning them to keep an eye out for symptoms, remove infected plants immediately, and begin a planning strategy for next year. Daily monitoring of the leaves and fruit of the tomato plant, planting disease-resistant varieties, controlling volunteers from the previous year’s seeds and rotating crops will help all tomato gardeners win the war against Tomato Late Blight. Anthracnose, bacterial leaf spot and blossom end rot are other tomato ailments with similar symptoms, but unlike other ailments, Tomato Late Blight will devastate an entire crop in days. Tomato Late Blight is the same blight that caused the Irish Potato Famine in the 1800’s. This blight can overwinter on live tissue in mild climates where the soils do not freeze, which brings the importance of crop rotation and volunteer tomato removal. Tomato Late Blight (Phytophthora infestans) prefers high humidity, dew, wet weather and moderate temperatures between 50 to 80 degrees F. Late blight symptoms can occur anytime during the growing season, but the disease may be slowed down by return of hot, dry weather. Tomato, potato, petunias, tomatillo, eggplant, and most plants in the Solanaceae family. Small dark brown to black, circular to irregularly-shaped, water-soaked lesions may begin on lower leaves and appear 5 days after infection. White spores, called “sporangia”, may be observed on brown lesions in humid conditions on the underside of leaves. Brown lesions can develop on stems and leaf pedicels. Fruit will have circular, greasy lesions and can occur at all stages of fruit production. The fruit may remain firm, but these spots can become leathery and grow to cover the entire fruit. Select resistant varieties such as the ones noted below. When starting from transplants, choose plants that appear to be disease free and show no symptoms. Inspect the plants carefully before purchasing. Control volunteers from last year’s fallen fruit. Rotate crops. Keep all Solanaceae plants out of the infected area for a minimum of three years. Monitor late blight forecast model at www.uspest.org or www.usablight.org for notifications. If symptoms are noticed, samples can be sent to the Washington State University Puyallup Plant & Insect Diagnostic Laboratory for testing to confirm the disease. Once the disease is confirmed, then it is necessary to remove affected plant tissue immediately and put it in your curbside compost bin. This material will be heated to a high enough temperature to kill the disease. Inform neighbors that your crop is infected and share information on prevention and control. Inspect your plants daily for signs of Tomato Late Blight. Rotting fruit should be put in the curbside compost bins. Unaffected fruit is safe to be eaten, just remove damaged part. Affected fruit should not be canned. The following varieties were tested in 2014 at Seattle Tilth’s Adult Learning Garden at the Good Shepherd Center in Wallingford, WA managed by Garden Hotline educator Sue Hartman. ‘Defiant’ (Johnny’s Seed Co.) – Hybrid determinate tomato bred and released by Johnny’s and North Carolina State University. Harvested 9/17/2014. No late blight in the trial. ‘Iron Lady’ (High Mowing Seed Co.) – Hybrid determinate tomato bred and released by High Mowing Seed Company in collaboration with Cornell University and North Carolina State University. Said to be resistant to early blight, late blight and Septoria leaf spot. Harvested 9/17/2014. In the trial, it resisted late blight but had the LEAST resistance to powdery mildew. ‘Legend’ (Territorial Seed Co.) – Hybrid determinate tomato bred and released by Dr. Jim Baggett at Oregon State University. Harvested 9/17/2014. Said to be early and late blight resistant. No late blight in our trial and showed NO powdery mildew despite growing right next to ‘Iron Lady. ‘Mountain Magic’ (Johnny’s Seed Co.) – Hybrid indeterminate tomato bred and released by Emeritus Professor Randy Gardner from North Carolina State University. Harvested 10/23/2014. No late blight but a little spotting on leaves. ‘Jasper’ Cherry (Johnny’s Seed Co.) – Hybrid indeterminate. Said to have intermediate resistance to early blight, Septoria Leaf Spot, Fusarium 1 & 2 and late blight. No late blight AND prolific in the trial. ‘Matt’s Wild Cherry’ (purchased starts at Seattle Tilth’s plant sale) – Open-pollinated, allegedly obtained in Hidalgo, Mexico. No late blight AND prolific in the trial. ‘Beam’s Yellow Pear’ (purchased starts at Seattle Tilth plant sale) – An heirloom that dates back to 1805 and was introduced to Seed Savers Exchange in 1983. No late blight in our trials.